Costumes are as stylized as the moves in traditional Chinese dance. Chinese dance classes provide an active way for children to experience the cultural arts of an ancient civilization, get some exercise, and develop grace and balance. Chinese dance schools in the United States cater to a growing Chinese immigrant population, as well as to children adopted from China and kids interested in multicultural dance traditions. Movements are stylized and symbolic, costumes and performances are colorful, and dance lessons provide an entree for very young children to begin to learn Mandarin or Cantonese. Young children learn simple Chinese nursery rhymes and act them out with classical moves set to music. This provides the foundation for the expressive use of hands, specific foot and head positions, and the round shapes that dominate traditional choreography. It also allows for absorbing the musical intonation of spoken Chinese and learning vocabulary through the sung lyrics. Chinese dance class for little ones focuses on synchronizing movements in a group, breaking into smaller groups to make patterns, and singing the songs loudly and correctly to reinforce pronunciation and aid in remembering the choreography. The hallmarks of Chinese dance are bearing, form and technical skill. Bearing distinguishes the dances and the dancers and is Chinese spirit captured in motion. Young dancers learn to work with rounded movements, using the waist as the axis to articulate the torso up and down, back and forth, and on an angle. Dances describe emotions as well as events in daily life. Form includes hundreds of delicate moves as subtle as eye direction, finger formations and vigorously flexed feet. Technical skills become more demanding with age. Children progress from simple martial arts moves to extremely challenging leaps, jumps, flips and turns. The Beijing Opera relies on one of the two main styles of Chinese dance -- court dances. The dances created for the emperor can be traced to the Qin dynasty, around 220 B.C., and became more elaborate until the Tang dynasty, an age of explosive advances in Chinese culture. Court dances include martial arts-based warrior dances and the more ritualized and subtle moves of Confucian court etiquette. Today, dances in Chinese court style might be created around ancient myths, such as the emperor's journey to the moon; history, including stories about heroes like Mulan; and literature, the many tales of the infamous Monkey King. Court dances use props such as ribbons, fans, handkerchiefs and traditional weapons: swords, spears and sticks. Ethnic and folk dances, no less stylized than court dances, reflect the many diverse cultures within China's vast geography and history. Each people and region has its own distinctive movements, costumes and signature dances. Ethnic dances come from the different minority groups, and folk dances are the inherited popular dances preserved throughout majority Han generations. Well-known ethnic dance styles a child may learn include exuberant Mongolian dances with steps and arm movements that call up horses and eagles, and props like wine cups, rice bowls and chopsticks. Miao, or Hmong, dances feature extravagant amounts of silver jewelry and pleated skirts. Moves accommodate the weight of the silver with great attention to hands and hip moves, spinning, clapping, and smaller kicks. Manchurian dances are true palace dances with elaborate silk costumes, mincing steps taken on high platform shoes, and exaggerated graceful arm, head and hand gestures. Lion and dragon dances are Lunar New Year specialties, particularly suited to older boy dancers or strong gymnasts. Each requires "wearing" some part of a sculpted lion's or dragon's head and supporting a long, sinuous cloth body or a stocky two-person costume, while moving in synchronization to a vigorous drum beat. You might see these dances in Chinatown streets during the New Year celebrations or as part of a Chinese dance festival or student showcase. 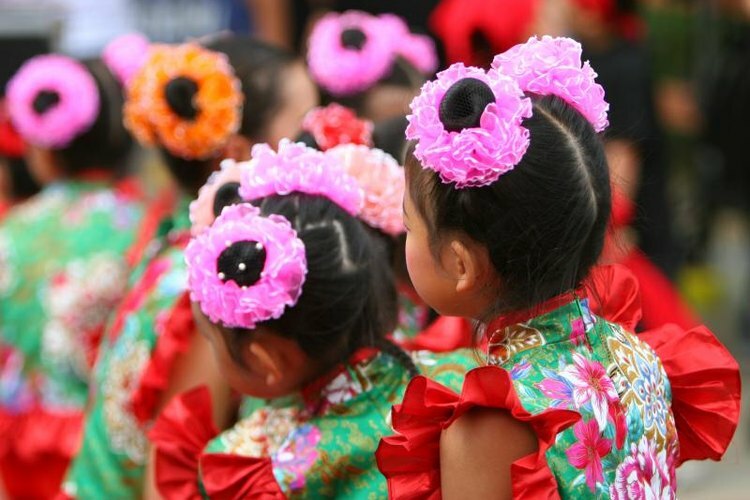 Younger children can participate in the parade that follows the lively dragon or lion, carrying red lanterns, strings of pretend firecrackers or red prosperity flowers.